CCSM actually labels the minimize function as “Unsupported.” Thanks for the “Head’s Up” on Unity Tweak Tool, though… I’ll uninstall it. I understand the GNOME desktop supports the minimize behavior and it would be nice if it could be added back to Unity. Changing the background has no effect on the lock screen background anymore. Lock-screen or the login screen? Update unity-settings-daemon. Try gsettings set org.gnome.settings-daemon.plugins.background active true and then reboot. It has always been labeled as “unsupported” but it works, it just means it is not an ‘official’ function, but kind of an extension. Unity-tweak doesn’t offer anything not already available in ccsm as far as compiz and unity go. But the setting button (about this computer, settubings etc) normally on the upper right corner is missing from the unity session. Update from the unity respin iso works without problems though. Still no dice, wifi icon is also missing. (also the best unity experience will be with lightdm, not gdm3. If still on gdm3 then after installing unity you must reboot, with lightdm any added sessions will work correctly with just a log out/in. I did remove and reinstall unity-desktop and choose lightdm as the default. strangely dash is now working after logging into gnome and then back to unity again (rebooting many times didn’t do the trick) But still no setting button and network manager tray icon. I’ll try reinstall os again and report back. Removing gnome-shell doesn’t restore the missing settings button and NM icon. It would be helpful to have a page to tell user the basic procedures to install unity in 18.04 (adding the unity-desktop ppa, install ubuntu-unity-desktop and related packages, use lightdm instead of gdm etc) I have been spreading the word for unity and actually quite a few people are interested but don’t know that it is possible to install it 18.04. Unity needs more visibility. Thank you. I removed Unity Tweak and set the option in CCSM and you’re right… it works! 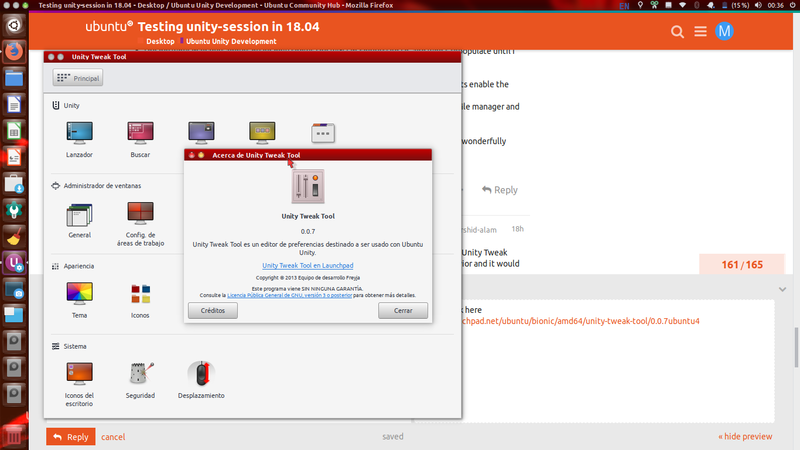 The ppa version of ubuntu-unity-desktop has a recommend of mpv. The repo version of mpv, (outdated), has a recommend of youtube-dl which pulls in other recommends, some reasonably useless. Youtube-dl can always be updated itself independent of the Operating System. Simply ‘youtube-dl -U’ will update it. I put it in a cronjob to do this monthly. Lots of options within youtube-dl - run it with the ‘-h’ switch to see 'em. Yes, but that has nothing to do with the repo youtube-dl package which cannot be updated in that manner. (- users that migrate to my ppa version & look at the desktop actions will find a link to upstream version, ect. hat has nothing to do with the repo youtube-dl package which cannot be updated in that manner. It can’t? Funny mine has worked that way. Did you try it? Of course, fresh 18.04, install repo mpv which installs repo youtube-dl, try the update command. A message will pop up that says "youtube-dl: error: youtube-dl’s self-update mechanism is disabled on Debian." You may have previously installed youtube-dl by other means, typically in /usr/local/bin (- what does which youtube-dl report? I install mpv from your ppa, and get youtube-dl with pip install -U youtube-dl… so really no need for these from repo. Agreed that youtube-dl is pretty useless if not updated regularly. But I think ccsm and compiz plugins should be included in ubuntu-unity-desktop, also xserver-xorg-input-synaptics since otherwise many touchpad options are missing in unity session on laptops, that will be enough to drive users away thinking that unity is broken. Here is a question. How do you change themes and font size without unity-tweak-tool?